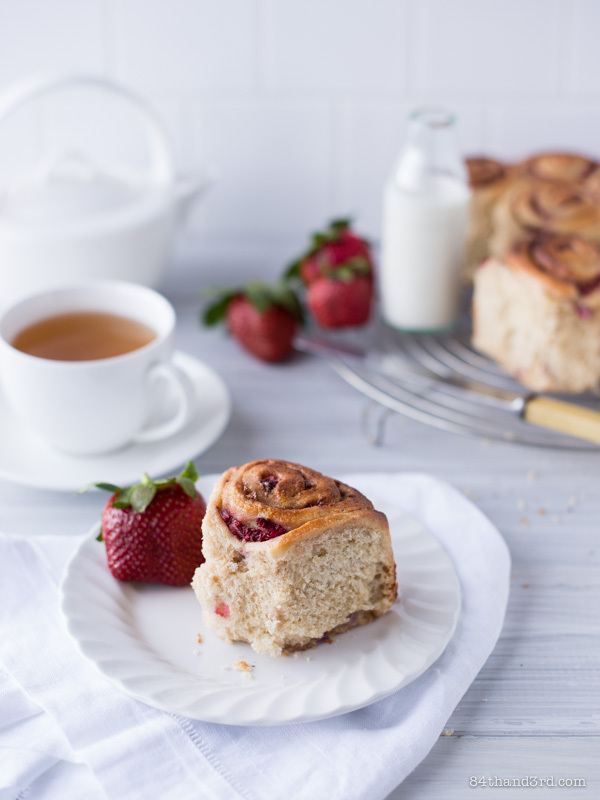 These babies are the result of a tryst between strawberry pie and a cinnamon roll… or more accurately a deep craving on my part for both. 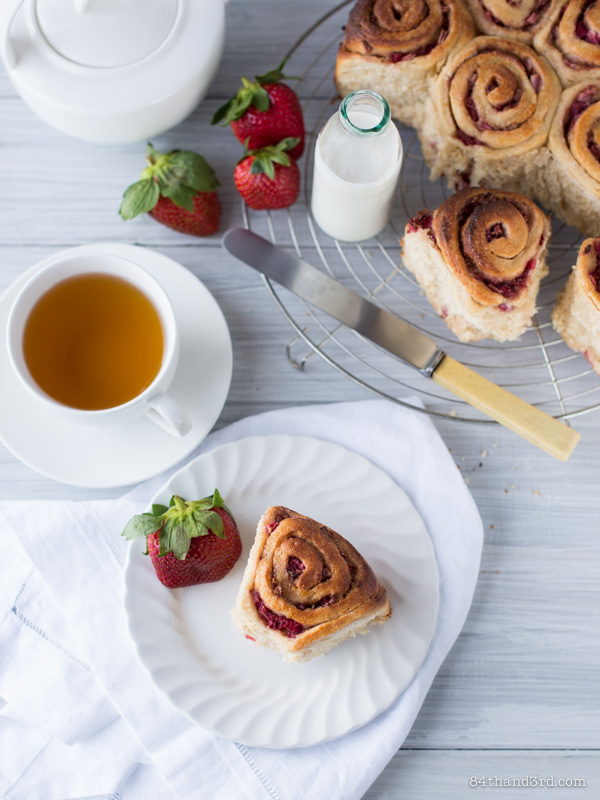 You see for some unknown reason cinnamon scrolls have been everywhere recently, and on top of that winter in Sydney means being simply inundated with strawberries (not that there’s anything wrong with that). 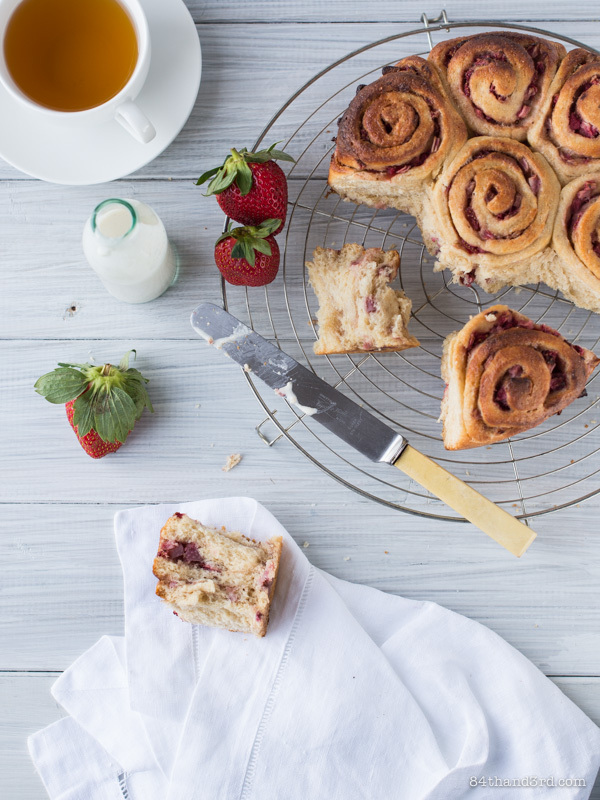 Berries and rolls taking over my Instagram feed as America-land gorges on cinnamon and summer. 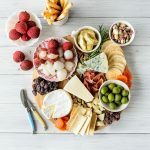 Berries taking over the supermarket shelves as they are cheaper in the middle of winter in Australia than at any point during summer because winter is berry harvesting season in tropical-weather Queensland. Berries taking over my computer as I research for a client article, and my kitchen as I whip up a last minute Strawberry & Blood Orange Margarita with the strawberries I didn’t use for these scolls. 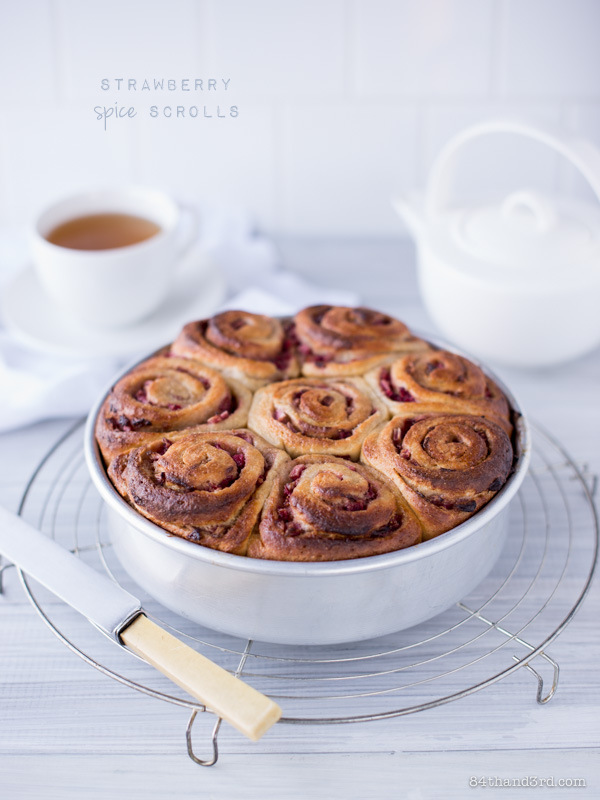 So I did what any self-respecting mad scientist cook would do — I made Spiced Strawberry Scrolls. A one-two punch if you will, served up for breakfast, lunch and dinner. The result of a tryst between strawberry pie and cinnamon rolls. So naughty, yet so very nice. Heat milk, syrup and oil until just warmer than room temperature. Pour into a large bowl, sprinkle over yeast and leave to prove until foamy. Add egg and 1 c white flour, beat 50 strokes with a wooden spoon. Add salt and all the whole wheat flour, beat 50 strokes. Add remaining ½ c white flour and mix through. Use extra white flour to dust bench top, scrape out dough, invert bowl over top and let rest 10 mins. Knead for 5 mins, adding a bit of extra flour as necessary, for a smooth but tacky dough. Invert bowl over dough and walk away for 2 mins. Knead a further 5 mins until you have a smooth dough. Pour a splash of olive oil in the bottom of your bowl — no need to wash it first — and turn dough to coat. Cover with baking paper and a tea towel and let rise in a warm spot for 1 hour or until doubled. While the dough is rising, mash ¼ c of the diced strawberries and mix well with softened butter. Grease an 8 x 8 inch round tin and line base with a piece of baking paper. Punch down dough, scrape onto well-floured benchtop, and roll into a 12 x 12 inch square. 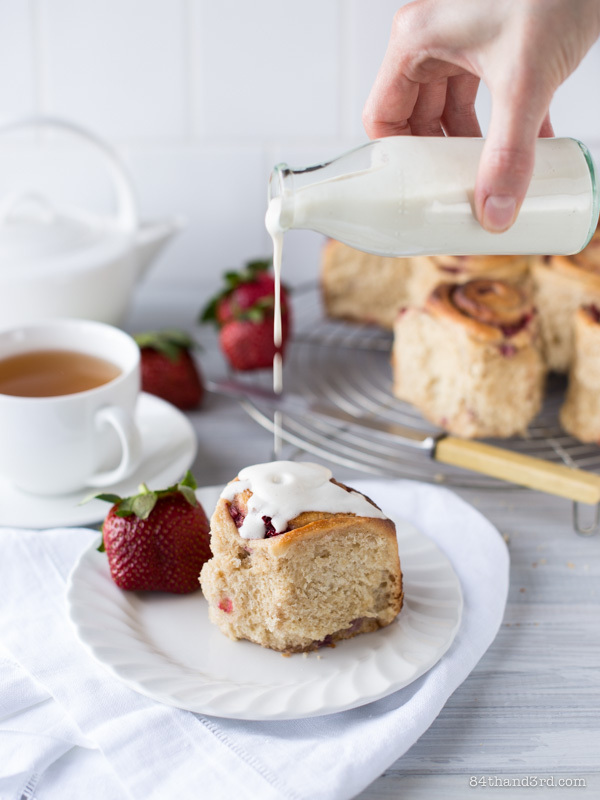 Spread strawberry butter all the way to left and right edge, leaving a half inch or so clear on the closest and furthest ends. Sprinkle butter with remaining 1 c diced strawberries, dust with spices, sprinkle with sugar. Roll tightly from the edge closest to you, pinching far edge to seal. Cut into 8 even pieces, arrange cut-side down in the prepared pan, cover with oiled baking paper and let rise approx 45 – 60 mins until doubled. During the last 15 mins of rising preheat oven to 180°C (350°F). Bake rolls 25 – 30 mins until golden brown and centre roll is cooked through. Cool in pan 5 mins, run a knife around the edge and turn out onto a rack to cool completely. Make a glaze: traditional glaze with a few spoonfuls of cream cheese, the same of powdered sugar or syrup, a squeeze of lemon juice and a splash of milk is always an option — or you can blend a handful of soaked cashews with a quarter-ish cup of coconut or almond milk and a squeeze of lemon juice, then sweeten to taste with rice or maple syrup. Dough is subject to the moisture content of your flour and the humidity of your kitchen, look for the texture cues in the recipe when adding flour (or not adding it) while kneading. 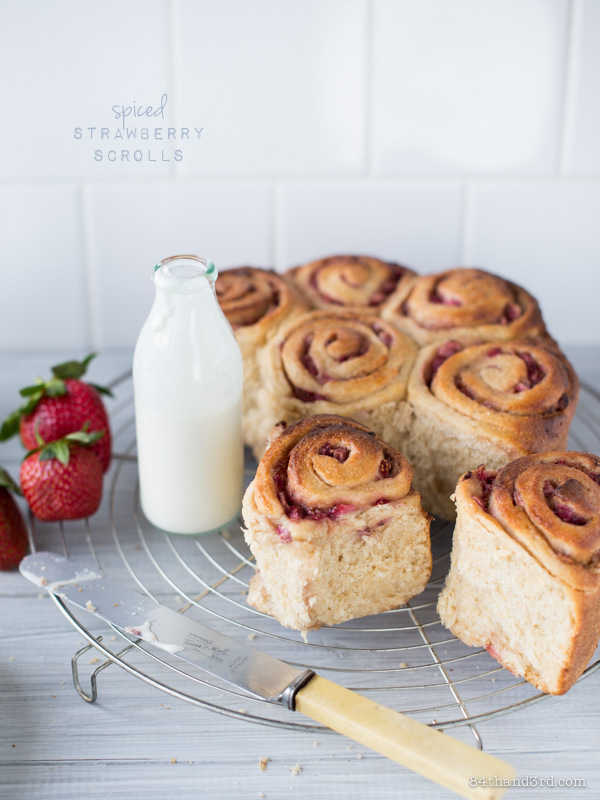 Beautiful scrolls, the strawberry filling looks divine! Nice one JJ! 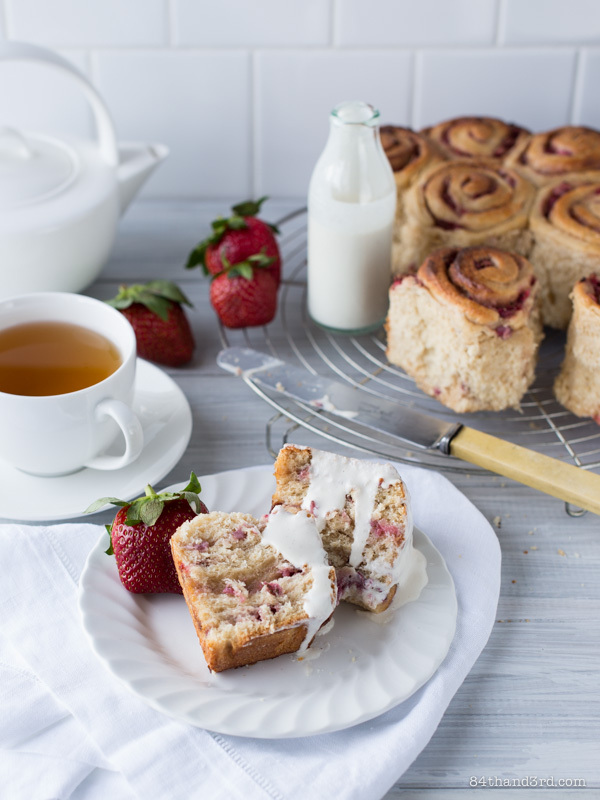 Love what you have done using strawberries instead of the traditional cinnamon. 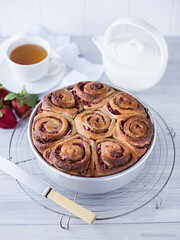 mmm this sounds like cinnamon scrolls on crack! yes pls!